Thank you for your interest in advertising in THE BEE! 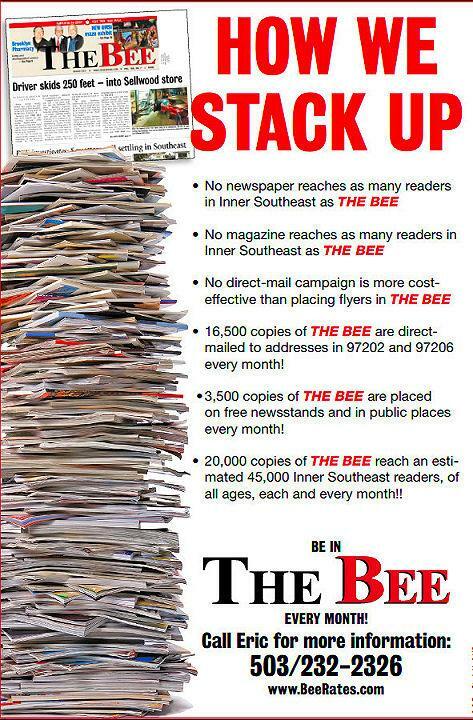 THE BEE distributes approximately 20,000 issues, published on the Friday nearest the first of each month -- except for the December issue (which comes out just before Thanksgiving) and the Christmas issue (which is technically the January issue, but comes out in the week before Christmas). Our parent company has established that an estimated 45,000 readers in Southeast Portland are reached by EACH ISSUE of THE BEE. We mail -- free -- 12,500 issues to ZIP Code 97202, and 4,000 issues to ZIP code 97206 (the western portion of that ZIP code -- primarily Woodstock). We thus distribute 16,500 copies monthly by mail, with another 3,500 copies placed on free newsstands within and just outside of our free mail distribution area. As pointed out above, we have 3,500 copies on free street newsstands, as well as distribution through retail store locations, throughout the Inner Southeast area -- which includes racks in the adjacent Creston-Kenilworth, Ardenwald, and Brentwood-Darlington neighborhoods. Our monthly deadlines are posted at the bottom of this page. If ad design is required, we do not charge to do it for you! Starting with the February 2018 issue, THE BEE got a promotion! It changed from a Tabloid size to a Broadsheet size! What this means is that the width of each page stayed the same -- but the height of each page has increased by over five inches, so our pages are now the same size as our sister newspaper The Portland Tribune, as well as all the weekly newspapers in our group of 23 Oregon newspapers! The information below has been corrected to reflect this upgrade. THE BEE is now presented in a "broadsheet" format, with the print space six columns wide (10.875" wide) and 21.5 inches from top to bottom. The basic building block of newspaper advertising is the "column inch". That consists of space one column wide (1.70") and one inch high. To determine the cost of an ad, using the rate grid below, multiply the number of columns wide the ad should be by the number of inches high. A typical quarter page is 3 columns across and 10.5 inches high (a "3x10.5"), or 31.5 column inches; a typical half page is a "6x10.5", or 63 column inches; a full page is a "6x21.5", or 129 column inches. THE BEE can accommodate any ad from one to six columns across, and from one inch high to twenty-one and a half inches high. 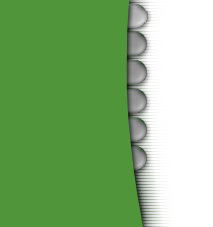 Pricing is rounded up to the nearest full column inch. Note that, in the rate grid below, as the ad gets bigger there is a discount that increases with the ad size; and, the more you buy, the bigger the discount given, as well. Full color can be added to any ad for a flat additional cost of $195, regardless of ad size. An inexpensive color alternative is adding "spot color" -- a single shade of color -- to any ad, regardless of size, for an additional $95. Please bear in mind that ad prices arrived at using the above grid, represent the PER-AD cost -- and NOT the total cost for an entire multi-month schedule of ads!! The price of INDIVIDUAL ads goes down -- when you choose a plan that includes more ads. "Volume discounts!!" Ask about additional discounts available for ads which are to run in others of the Community Newspapers/Pamplin Media group in the Portland area -- which include the adjacent Southwest Community Connection, The Lake Oswego Review, The West Linn Tidings, The Clackamas Review, the citywide Portland Tribune, and others. (Ad rates shown were made effective on June 1, 2007.). If you have questions, or would like to order, call Eric Norberg at 503 / 232-2326 anytime. MORE THAN DOUBLE YOUR ADVERTISING IMPACT!! You can buy an ad in any of our other 23 metro and Oregon newspapers in conjunction with an ad buy into THE BEE, and receive a substantial discount on the other papers. That offer, though special, is an ongoing offer. However, to supplement your BEE advertising with areawide impact, there's a VERY special additional low rate, exclusive to BEE advertisers -- $30 per column inch, greyscale -- for running your BEE ad in both the Tuesday and the Thursday editions of our flagship citywide newspaper, the Portland Tribune. The deadline for the Tribune is 7 days before press; that means that the deadline for the ad to appear in both copies of the Tribune in one week would be the Tuesday one week before the Tuesday of the week in which it is first to appear. Order the ad through THE BEE by this date to be assured of placement. 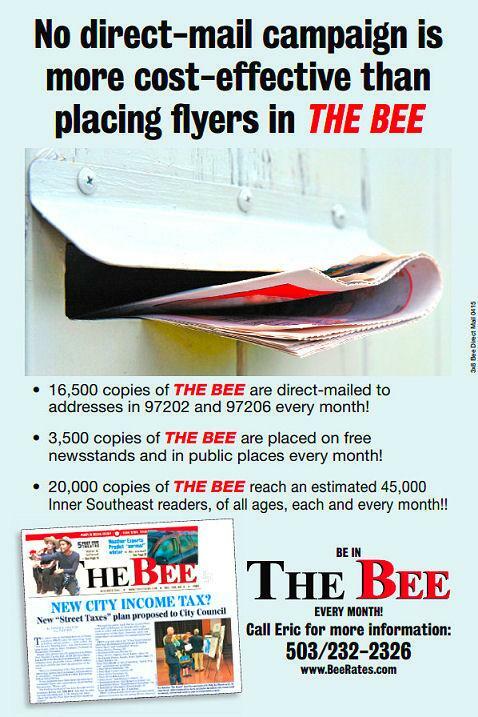 NOTE: In order to take advantage of this offer, THE BEE must be your primary newspaper for advertising in the Pamplin Media Group (Community Newspapers Inc). Cross-sell discounts in all these papers are based upon standard rates being in effect at the primary newspaper, with the others being adjunct to the primary ad buys. Political advertising is specifically excluded from this offer. For details, or to arrange to have your ad appear both in the Tribune and in THE BEE, call Eric Norberg at THE BEE, at 503/232-2326. In addition to standard display advertising, THE BEE offers a "Here's My Card" business card advertising display. Each ad is horizontal -- and the size of a standard business card, 3.25" wide and 2" high. They are arranged three across, appearing exclusively on two pages of the newspaper. The color option is not available for these "Here's My Card" ads. These ads are the size of business cards, but do not have to be an exact reproduction of your business card. They can even be styled like small display ads! If ad design is required, we do not charge clients for doing it, as noted previously; and all ad design is subject to your approval. "Inserts" are single sheet, pre-printed, letter-size flyers -- placed in the fold of the newspaper. The basic rate for inserts is $45 per thousand for single-sheet, letter-size inserts (that's by far the least expensive manner of direct-mail distribution of your flyer available). Insert orders must be prepaid, and the inserts are to be provided pre-printed in time for the desired issue's deadline date (see upcoming issue deadline dates on the bottom of this webpage). The Post Office requires of us that any inserts in the newspaper be sent to the entire ZIP Code; we are not allowed to break out insert distribution by carrier route, under our class of postage. ...And any quantity, up to 3,500, can be placed in the newsstand copies, as well, also at $45 per thousand. If these inserts are to be placed in all 20,000 copies, the total investment would be $900.00. THE BEE offers "Community Classifieds", in cooperation with all of the Community Newspapers group in Portland and vicinity. You can buy a classified just in THE BEE, or in any combination of the 24 newspapers, for discounts. Because of this, all classifieds are handled from a central office. Call 503/620-7355 during weekday business hours for information, or to order a classifed ad! Ad copy can be delivered by e-mail, fax, or US Mail. Electronic ad files can be delivered on CD-ROM or DVD, thumb drive -- or (preferably, if under about 25 MB in size) can be e-mailed to: readthebee@myexcel.com. For ad-timing considerations: The newspaper is printed on Friday, 8 days after the deadline, and mailed on the following Monday (or Tuesday, if Monday is a holiday). It goes to the newsstands after the initial mail distribution is completed. SPECIAL ADVISORY: As a matter of corporate policy at Pamplin Media, advertising is not accepted in any of our newspapers, including THE BEE, for businesses dealing in anything illegal at the federal level, even if it is considered permitted in the State of Oregon. Therefore, for example, advertising is not accepted for any business selling marijuana, whether for medicinal or recreational purposes. Currently, marijuana advertising is held by the U.S. Post Office as sufficient reason to prohibit the mailing of any newspaper containing such advertising. Interested in advertising on the Community Newspapers Inc. website for THE BEE (www.thebeenews.com)? Or on the high-hits-volume Portland Tribune website? Or perhaps in a package of ALL our 24 local newspapers' websites..? Click on the button at right, to download all of that information in one convenient reference!